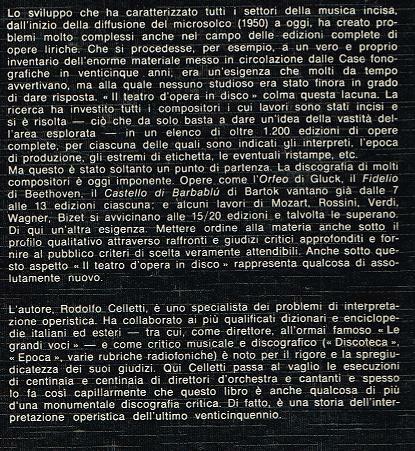 “Celletti was born in Rome on 13 June 1917. He served in the Italian army from 1937 to 1943, and after World War II, took a degree in law from the University of Rome. He became a successful business executive in Milan, and then created a second career for himself as a (self-taught) musicologist and critic. 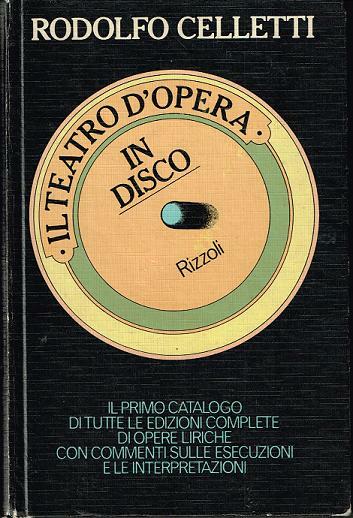 For many years he was the music critic of the Italian weekly magazine EPOCA and was a regular contributor to LA REPUBBLICA, L'OPERA, NUOVA RIVISTA MUSICALE ITALIANA, OPERA, and AMADEUS. 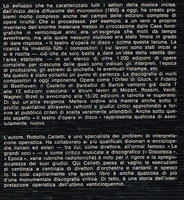 In addition to his articles in specialist publications and THE NEW GROVE DICTIONARY OF OPERA, he published several books, most notably LE GRANDI VOCI (1964), at the time considered the most complete biographical and critical source available on the great operatic voices and STORIA DEL BELCANTO (1983) [above], which has since been translated into English, French, German and Czech.